Since my first day as president, I’ve talked about building a bold, new future with your help. That’s why I hope you’ll join me next week for a series of campus conversations to share your aspirations for UCF and how we can make them a reality. Monday, Sept. 24, 11 a.m.
Tuesday, Sept. 25, 11 a.m.
At these forums, I challenge you to think deeply about the UCF we can and should be, and what it’ll take to get us there. I’m particularly interested in how our talent and innovation will impact our community and how we can harness our strengths and partnerships to solve big, local problems with global solutions. If you can’t attend in person, you can watch and ask questions via UCF’s YouTube channel. I also hope you’ll share your questions and feedback ahead of time at Dale.Whittaker@ucf.edu. By sharing our diverse viewpoints and working together, we’ll create the future our students and community deserve. Not long ago, I announced a reorganization that gives us an opportunity to redouble our efforts launching the types of strategic partnerships that have always been part of UCF’s DNA. We know from experience that partnering with others can create meaningful change for our students, faculty and community. Today, I’m excited to announce a collaboration with Microsoft, a global company that shares our dedication to innovation. Together, we will evaluate and develop educational initiatives ranging from research and teaching to optimized learning environments for our students. It’s a wide-ranging collaboration across many disciplines. One important component is that UCF has been named a Microsoft Flagship School, a designation that connects us with a community of like-minded leaders dedicated to applying innovation, best practices and advanced technology to drive the evolution of education and set an example for other schools globally. 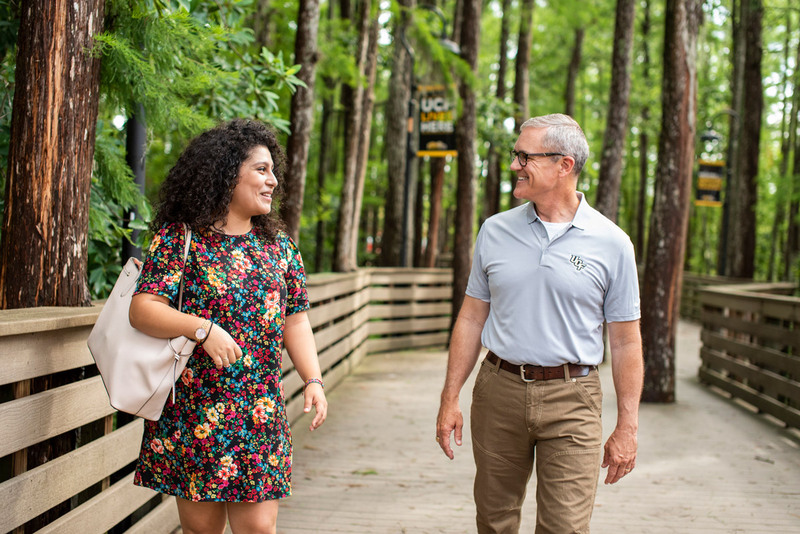 UCF is part of the first cohort of Flagship Schools around the world and one of the first higher education institutions selected in North America. This distinction reflects our willingness to try new approaches to help our students succeed. It’s an impressive testament to both the caliber of our students and graduates, as well as the outstanding work of our faculty and staff. I look forward to sharing much more about these many opportunities in the coming months. Big, creative initiatives like these are one reason U.S. News & World Report just ranked UCF No. 10 on its list of “most innovative schools,” above Duke and Johns Hopkins universities and Ivy League schools such as Harvard and Princeton. Like the region we serve, UCF’s strength comes from its diversity. As of this fall, nearly half of our students are from groups underrepresented in higher education. That includes 26 percent — or nearly 18,000 students — who are Hispanic. This week, UCF celebrated its first National Hispanic-Serving Institutions Week and kicked off Hispanic Heritage Month. Our upcoming HSI classification will allow us to seek federal funding to better serve our Hispanic students. UCF already awards the third-most degrees to underrepresented students in the nation. And we’re committed to ensuring all of our students have opportunities to reach their full potential while they’re here and after they graduate. That’s the power of UCF.